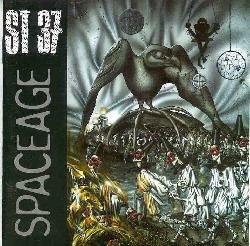 Despite the suggestion given by the album title, 'Spaceage' is less about spacerock than it is about 'neo-psychedelia,' as from the likes of SunDial or Bevis Frond. But whereas these contemporaries tend towards a harder-edged sound, ST 37 generally sticks to a more laid back and gentle approach, although we also hear occasional noisy or dissonant passages. The songs from this five-piece Texan combo (with various guests) start with a base of understated hypnotic rhythms, and then build upon that with swirling guitars and/or electronics, echo effects, and (seemingly) half-hearted vocalizations. Many of the pieces sound distant, as if poorly miked; a risky maneuver (if intentional) that works in a bizarre way to yield a 'really out there' kind of effect. A quick look at the track list might give the impression that this is entirely a tribute album, as there are no less than five classics covered on 'Spaceage.' Personally, I can understand the remaking of both Chrome's 'March of the Chrome Police' and Hawkwind's 'Orgone Accumulator,' as the album is dedicated to fallen comrades Damon Edge and Robert Calvert, but the other three seem really unnecessary. In fact, the original material is far stronger than these forgettable remakes, save a nice rendition of Can's 'Vitamin C,' which no doubt works here due to ST 37's proficiency with like rhythms. That said, I can't argue that I'm being cheated here either, as the original tunes amount to a full 48 minutes of listening pleasure. Despite many of the tracks seeming to be only rough sketches of songs performed hastily, it's the spirit of this music that I find so intriguing, in the same way as some of the innovative German artists of the early days. And strange as it may seem, there are times here ('Concrete Island,' for instance) when I swear I'm listening to the latter half of Jane's Addiction's 'Ritual de lo Habitual,' the album where Perry Farrell and Co. 'experimented' with this same brand of low-key psychedelia. Whereas their alternative counterparts were perhaps stretching themselves a bit, ST 37 appears right at home in this niche. I'm really looking forward to this band's performance at this year's Strange Daze festival. They're a mood-setting band if I've ever heard one.